Having just read ANOTHER post expounding "insider knowledge" on how to get the best airline seats that did not teach me anything I have decided to share my own actual traveler experience on how to increase your odds to get an optimal seat. No, it won't guarantee a good seat and will not help you if the airplane is packed to the gills, but with a little bit of planning it may work. It can be summarised into two main points: 1) Understand your airlines seating model; and 2) Play the seating game once online check-in opens. As this is from my own experience and preferences which excludes bulk-head seats I am not going to address them in this post, except that the earlier you book your seat the better. Or, work out how the Airline automatically assigns seats to people who do not request one. All airlines fill up economy from the front of the plane. The difference is whether or not they allocate the middle seats before moving to the next row, but what it means to the traveler is that the odds are that you're going to get better seating options towards the rear of the plane. I benefited from this on a flight from Islamabad to Bangkok (there were others, but I can't recall the specifics.) Economy was in 2 cabins, fore and aft. My friend and I selected seats in the aft cabin where on the red-eye flight we had 4 seats each to stretch out and get a good nap. I later found the other members of my party packed like sardines in a completely full front cabin. bulkhead and emergency seats may not have removable arm-rests. This game requires you to initially book the best seat for you, aisle or window, that is towards the rear of the cabin. It works on the principles of no-one wants a middle seat; and the airline automated seat allocation program. If you are traveling with another person, book the aisle AND the window seat - and not the middle one. This will significantly address the odds of the spare seat between you remaining unoccupied. If there is someone sitting in the middle seat and you want to give them the window seat to sit next to your partner... I cannot see them objecting to it! Start checking if your seat is still optimal or should you change? About 12-24 hours after online check-in opens go to online check-in and check how the plane is filling up ... Decide whether or not your seat is still optimal, which for me is a window seat with at least one seat next to me open. Now, here's the key: DON'T COMPLETE CHECK IN OR PRINT YOUR BOARDING PASS. By doing so you "lock in" your seat and it cannot be changed. Repeat the above step about 12 hours later. By this time the plane is pretty full and you should be in your final step. DON'T COMPLETE THE CHECK IN PROCESS! About 3 or 4 hours before your flight do a final check to see that your seat is still the best one available. If you want to complete the check in process; or do so at the airport ... your seat is your seat. Unless I am booking a premium seat I refuse to pay a fee to reserve my seat as I can do this via the online check-in process for free! A couple of airlines have gotten wise to this loophole and will give you an allocated seat with a paid option to change. In this case, if you're allocated a non-optimal seat - exit the check-in process and start again in 10/so minutes when you will be allocated a new seat as other passengers have checked in. You will also be able to pick up on the automated seat allocation process used by the airline by repeating the check-in process a couple of times. I hope that you have found this useful and relevant. I have spent way too many hours in the sky, both in the pursuit of work and pleasure, and I use this myself. If you have any useful tips, please leave them in the comments section and I'll include them at the foot of this post. One of the benefits (or drawbacks) of living in South Africa is that having a car is a necessity. The lack of a vast public transport infrastructure means that for most people the daily commute cannot be avoided, but during the weekends having your own vehicle allows you to go out and explore the countryside. 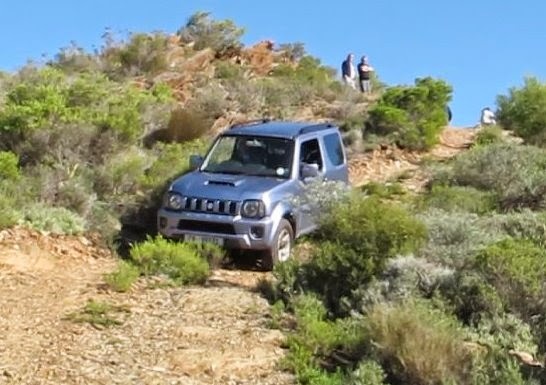 My chosen form of transport is the Suzuki Jimny. Its a small little car - only 2 doors and a 1.3l engine - but it packs a great deal of adventure into its size. My sister refers to it as "the Noddy car" and a 10 year old nephew is convinced that if he pushes it hard enough it'll roll over (which it will, but I'm not telling him that). Oh - and did I mention that it has 4x4 capabilities? Today is the first day of Open Design Cape Town at the City Hall. I'm working with Make Games SA at their stand which has a number of games from South African game designers available for you to play. Here are some images from the set up. Come by for a visit if you are in Cape Town. It is running until 23 August and there is free parking at Grand Parade for those attending. On Wednesday (7 May) I made my mark in South Africa's general elections - 20 years after the first democratic elections in 1994. 2014 was not the first time I'd voted, but it was the first time I'd experienced the amazing togetherness of the Rainbow Nation that is our legacy. There are times when this amazing country of ours puts aside its history, past and violence and comes together as the great country that we are: the elections in 1994; the winning of the rugby world cup in 1995. After that it seemed that some of the magic had been lost but the country came together for the 2010 Soccer World Cup (which I watched with longing from abroad.) This week I had my chance to participate and saw that even after his death Madiba’s magic is still there. Its been a while since my last post (and way more than a week). This is because there were a number of things that happened during that week that I have had to take time to process and to come to terms with. It is my policy to be honest on this blog, but at the same time I want it to be upbeat and positive for the reader and usually I subscribe to the the mantra that if I don't have anything nice to say, then I don't say it. In this case, however, I feel that I need to finish the story of my Divemaster Internship. I am currently in Nigeria, working in Enugu, the state capital of Enugu state – or the coal state – around 200kms north of Port Harcourt and was pleasantly surprised on Saturday around midday to find that there was a wedding celebration going on at the hotel I am staying at. On a previous visit to Nigeria I’d arrived at my hotel to find it full of people- notably the women – brightly bedecked in the beautiful dresses and headdresses that make up their formal dress, but I was too embarrassed then to go and ask if I could take pictures. Today, however I did and want to share the pictures with you and a little bit of Nigerian culture in the process. Thank you very much to Oge and Frank for allowing me to share a part of your special day and I wish you all the best for your future. For those who want copies of the pictures please click here and then you can download the pictures from the album - use "right click and save as"
The BIG news on my 3rd week on the island was a plane carrying Local Government Secretary Jesse Robredo that crashed into the sea just short of the runway for Masbate City airport (about 150kms north of Malapascua) on Friday afternoon and on Monday morning the Evolution Dive Team were helicoptered along with all their gear to assist in looking for the wreckage of the plane and hopefully survivors. Unfortunately the body of the plane was found with the 3 missing persons (Jessee Robredo and pilot and co-pilot) on the 2nd day at a depth of 65m. The shop was really quiet at this point and because my instructor was involved in the search and recovery operation I went on a couple of dives with clients, but for a while I had a pretty open schedule. Wow - it was busy, and then quiet and then busy again. I was very busy in assisting with an open water course with 4 people for the first few days. The first open water dive was quite an experience. We finished the confined water skills for the 4 open water students and a Discover Scuba Student (a single introductory dive for people who just want to see if diving is for them) and then headed off to deeper waters to take them on their first dive. So we had 5 students between the 2 of us. No sooner than the instructor would help one of the students start swimming underwater near the corals than another one (who'd previously been swimming quite comfortably underwater) would pop up to the surface (okay we were only at 3m) and then to make things even more fun 2 of the students got bored and decided to go off exploring on their own and I was banging my tank to try and get their attention to stay with the group. Fortunately the rest of the course went off pretty uneventfully. I arrived on the island of Malapascua a week ago to start my Dive Master Internship with Evolution Divers I’ve had my Open Water certification since 2003 and have been diving pretty regularly since moving to Singapore in 2008 and have logged over 160 dives in the process and visited some of Asia’s most beautiful spots (with an infinite number left to travel to). I’d spoken to a number of fellow divers about where to progress to in my diving and had heard horror stories about DM courses where you are treated as a general dogsbody and put into the most extreme situations to find out how you react under pressure. Now as I like my diving to be as gentle and stress free as possible it has taken me a while to change my mindset to take on a professional certification where I am now responsible for the well being and enjoyment of others. On deciding to take the plunge I canvassed my friends to find a dive shop in a location with interesting diving that also had a strong commitment to safety and where I would be learning exactly how things should be done as well as getting a wide range of experience with customers from open water and discover diving courses to leading experienced divers on dives to explore the area and Evolution Divers seemed to fit the bill.